For the second straight time, Denis Shapovalov is out in the first round of a grass-court championship. 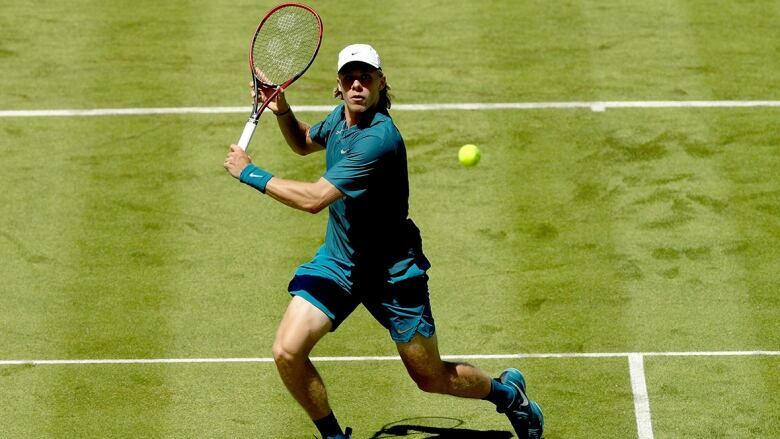 Shapovalov lost 7-6 (9-7), 7-6 (8-6) to Gilles Muller in the opening round of the Fever-Tree Championships at Queen's Club on Monday morning. For the second straight time, Denis Shapovalov is out in the first round of a grass-court tournament. Shapovalov, of Richmond Hill, Ont., lost 7-6 (9-7), 7-6 (8-6) to Gilles Muller in the opening round of the Fever-Tree Championships at Queen's Club on Monday morning. The 19-year-old Canadian won 75 per cent of his first serve points, while world No. 46 Muller capitalized on 96 per cent. Muller will play tournament top seed Marin Cilic in the Round of 16. Fellow Canadian Milos Raonic made the final of that tournament, losing to Roger Federer 6-4, 7-6 (7-3) on Sunday. He'll be looking to build on an impressive season opening debut on grass when he faces qualifier Yuki Bhambri in his first-round match on Tuesday morning. The Thornhill, Ont. native is currently ranked No. 31 in the world.